I have been busy making boxed sets of cards for a client. Here is a card from one of the boxed sets. I wish my camera had caught the beauty of this card. The wisteria is so soft and pretty. I just love it! I love this card. Gorgeous colors and sponging. Beautiful card. I love the colors especially the flowers. So pretty. Absolutely Gorgeous! The embossed images are beautiful! Your Christmas Cards are beautiful! 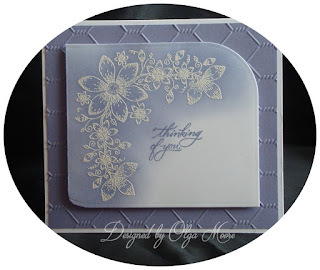 Can you tell me what embossing folders you used on the fourth card (twig wreath) and the sixth (small poinsettia in frame)?